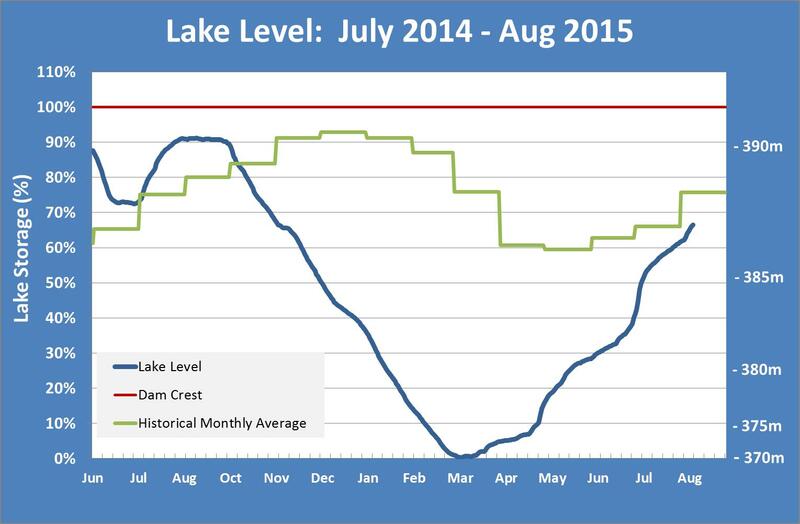 As at 10th August, the lake level has reached 67% (387.2m RL). The chart indicates that are below the historical average for August of 76% (388.4m RL) and below the level at the same time last year 82% (389.1m RL). However, the increased rate of fill over the last week is encouraging although the cold temperatures have eased the inflows back over the weekend. We have been able to maintain the releases from the dam at a minimum of 1.5 cumecs as the lower catchment river flows have maintained adequate flow at Saleyards Bridge. We have had a series of rolling Water Shortage Directions in place through OEFRAG and ECan, that have assisted in maintaining a minimum flow regime at the lake. Our efforts are concentrated on getting the lake as close to 100% full by the end of September as we can. There is some fresh snow surrounding the lake and on the hills behind the dam. Up until this latest snowfall, there appeared to be even less snow than at the same time last year. We will need to wait for a few days to establish the extent of snowpack top-up from the last few days.